Forget marshmallow chickens, the true sign of spring is the Friends of Dublin Library’s Spring Semi-Annual Used Book Sale, and it’s happening this weekend, Saturday, March 31 – Sunday, April 1, 2018! Yes, the library is open on Easter Sunday, and while you’re here, you can pick up a bag-o-books at the used book sale (see details below). Don’t be an April Fool and miss out on the great deals. As always, proceeds from the sale go towards funding library programs and purchasing library materials. Saturday, March 31, Members only: 9:00 a.m. to 11:00 a.m. Membership applications available at 8:30 a.m.
Saturday, March 31, Open to all: 11:00 a.m. to 4:00 p.m.
Sunday, April 1: 1:00 p.m. to 4:00 p.m. Bag Day: $4.00 / bag of books (bag supplied). Bag Day Special: 1/2 off on selected audio-visual and specially priced items! 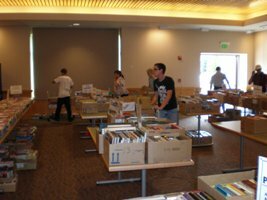 Friends of Dublin Library’s Fall Book Sale will be held on Saturday, September 30, 2017, at Dublin Library, 200 Civic Plaza, Dublin, CA 94568, from 9:00 a.m. to 4:00 p.m., and on Sunday, October 1st, 2017, from 1:00 – 4:00 p.m.
Saturday, September 30th: Members Only – 9:00 – 11:00 a.m.
Open to Public – 11:00 AM – 4:00 p.m.
Shop for bargain treasures at the Friends of the Dublin Library fall book sale! The sale includes gently used hardbacks and paperbacks, children’s books, media such as DVDs, books on CD, and music CDs. The first two hours of Saturday’s sale is reserved for members only. New memberships can be purchased at the door starting at 8:30 a.m. Annual memberships are $10 for individuals, 18 & over; $20 for a Family Membership and $100 for a Lifetime Membership. Sunday, October 1st is Bag Day. Fill a bag with books for only $4.00. Bags are provided. All proceeds benefit the Dublin Library. Friends of Dublin Library, Inc. proudly present their Spring Semi-Annual Used Book Sale on March 25 – 26, 2017. Proceeds from the sale go towards funding library programs and purchasing library materials. Please note the hours, which have changed. Members only: 9:00 a.m. to 11:00 a.m. Membership applications available 15 8:30 a.m.
Open to all, 11:00 a.m. – 4:00 p.m.
Sunday, March 26: 1:00 p.m. – 4:00 p.m.
Prices: Mass market paperbacks and children’s books: 50 ¢ each. Oversize and trade paperbacks, hardbacks: $1 each. DVDs and CDs: $1 / disc or set. Audio-books: Priced as marked. New book category: #5 – Biographies. Friends of Dublin Library, Inc. proudly presents its Fall Semi-Annual Used Book Sale on October 1 – 2, 2016. Proceeds from this sale go towards funding library programs and purchasing library materials. Note that the book sale will be held on two days only, Saturday, October 1st and Sunday, October 2nd. Saturday, October 1: Members only from 9:00 AM to 11:00 AM. Membership applications will be available from 8:30 AM. Bag Day Special: 1/2 off on selected audio-visual, vintage, and specially priced items. Friends of Dublin Library, Inc. are proud to present their Spring Semi-Annual Used Book Sale at Dublin Library on March 26 – 27, 2016. Saturday, March 26 from 9 AM to 11 AM will be a Members-Only Sale. Membership applications will be available from 8:30 AM on. Annual membership: $10 / individual (18 and over. Family membership: (children of school age): $20, and Lifetime membership: $100. SATURDAY, March 26 from 11 AM to 4 PM, the book sale will be open to all. SUNDAY, March 27: 1 PM – 4 PM is BAG DAY: $4.00 for a bag of books (bag supplied). BAG DAY SPECIAL: 1/2 off on selected audio-visual, vintage, and specially priced items! Note: If you don’t find what you want at the Friends of Dublin Library, Inc., book sale, check out the Friends’ online bookstore: http://fdl.alibrisstore.com . 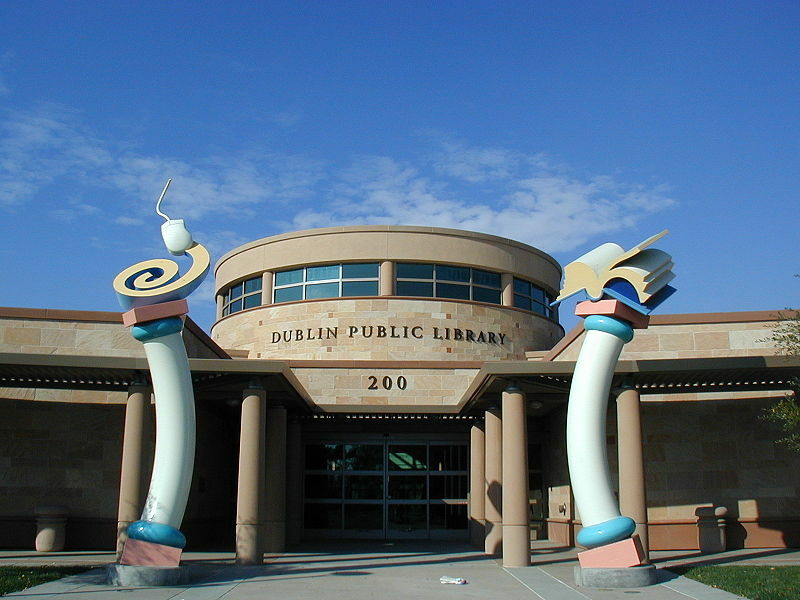 The Friends of Dublin Library, Inc. will present their Spring Semi-Annual Book Sale at the Dublin Library, on March 6 – 8, 2015. Membership applications will be available at 5:30 PM. BAG DAY SPECIAL: 1/2 OFF ON SELECTED AUDIO-VISUAL, VINTAGE, AND SPECIALLY-PRICED ITEMS! NEW: If you don’t find what you want at our sale, check out the new Friends’ online book store: http://fdl.alibrisstore.com . The Friends of the Dublin Library. Inc. is back in action after successfully incorporating its organization. The Friends will be presenting its semi-annual Used Book Sale in the Dublin Library during the weekend of September 12th – 14th, 2014. Here is an excellent opportunity to shop for bargains in gently-used hardbacks and paperbacks, children’s books, audio and video tapes, DVDs, books on tape and music CDs and help provide funding for library programs. Friday, Sept. 12, 6:00-8:00 p.m. Members-only night. Join or renew your membership at the door. Applications are available starting at 5:30 p.m. Annual membership: $10 individual (18 and over); family (including children of school age) for $20; Lifetime membership for $100. The booksale continues on Saturday, Sept. 13 from 10:00 a.m. – 4:00 p.m. and on Sunday, Sept. 14 from 1:00 p.m. – 4:00 p.m.
Sunday is BAG DAY when you pay $4.00 for a bag of books (bag supplied). Bag Day Special: 1/2 off on selected audio-visual, vintage, and specially-priced items. Sale Extras at this sale: Specially Priced Items (new and/or of extra value), Teacher Materials, vintage books, and book collections. Incorporation Celebration Special: One free (regular price) book with your purchase of any other books! New: If you don’t find what you want at our sale, check out the new Friends’ online bookstore: http://fdl.alibrisstore.com .